The mountain is an easy day trip from either Seattle or ​Tacoma, and it’s one of the national parks nearest to Seattle. Mt. Rainier is so prominent that it’s become a symbol for the area—you’ll spot it on license plates, T-shirts, postcards, and more. Once you get the lay of the land, having such a major landmark also serves as a great way to keep track of which direction you're facing. So long as there aren't low clouds, you can spot Mt. Rainier from many places around Seattle. Often it will simply be there as you’re driving on I-5 or wandering through a park. Some of the best views include pairing the mountain with other Northwest scenery. Walk along the shoreline at Discovery Park and you’ll enjoy a stellar scene with water, the shoreline, and Mt. Rainier in the distance. In fact, while you can catch a glimpse of the mountain from many places in Seattle, getting out on the water is one of the best ways—take a ferry to Bainbridge Island or Bremerton, and bring your camera for sheer Northwest goodness. Of course, a journey up the Space Needle, Columbia Tower, Smith Tower, or other viewpoints in the city will also score you a view of the mountain (and everything else too)! You can also see Mt. Rainier from other Western Washington cities as well, including Everett, Tacoma, all the way down to Olympia, the state capital. Depending on where you’re at, you may even get glimpses of other major peaks in the area, including Mt. Adams to the south, the Cascades to the east and the Olympics to the west. 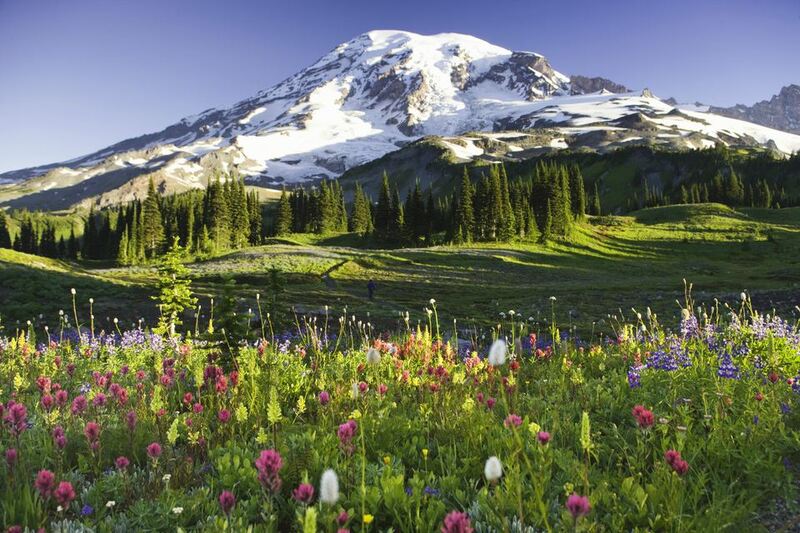 The mountain is located two hours south of Seattle, and there are a few ways to visit it. Drive: If you’re going on your own, a road trip is best and Mt. Rainier is the perfect distance away for a day trip. Take I-5 south from Seattle and then you can either branch off to 405, followed by 167, and then to Meridian, which goes out to the national park. Or you can take I-5 all the way south to Tacoma and take State Route 7 (Pacific Avenue) from there. Both ways take the same amount of time, with the Pacific Avenue route being just slightly longer. Both Pacific and Meridian take you straight to the national park where Mt. Rainier is located, but to opposite sides of the park. Once you’re in the park, you can loop around and come out on the other side of the mountain. Or you can turn around and go back the same way you came in. Book a tour: If you’d prefer not to do the driving yourself, you can join up with a tour from Seattle (or hire an Uber, but don’t expect the bill to be cheap). There are several companies that offer such day tours, including Tours Northwest, Customized Tours, and Viator. Tours tend to be about 10 hours long and include stops at Paradise or Longmire visitor centers, plus a few key spots along the way. Christine Falls, Reflection Lake, and Narada Falls are usual offenders. Fly: Of course, you don’t have to drive at all. Kenmore Air has air tours in small planes that circle not only Mt. Rainier, but also Mt. St. Helens. If you’re looking for the most breathtaking way to view this already pretty breathtaking mountain, this is it. Mt. Rainier has gone by many names. The Puyallup people called it Tacoma, Tacobeh, or Tahoma, and of course, those names led to the name of the modern city of Tacoma. Most parts of Tacoma are only an hour away from the national park entrance. Mt. Rainier came to be known by its current moniker after George Vancouver named it for his friend, Rear Admiral Peter Rainier. But it wasn’t until 1890 that the U.S. Board of Geographic Names officially declared the mountain would be Mt. Rainier, and even today you’ll see plenty of references to both its official name as well as Mt. Tacoma, Tahoma, and other native names. Mt. Rainier is a 14,411-foot-high volcano, and it’s one of several volcanos in the area. Others include Mt. St. Helens and Mt. Adams to the south, plus Mt. Baker to the north of Seattle, all in the Cascade Range. However, Mt. Rainier is by far the most dangerous. If it were to blow, it would likely set off what are called lahars (giant mudslides) that could reach cities in valleys around the mountain. The estimated damage would be so massive that Mt. Rainier is one of 16 Decade Volcanoes in the world (the designation for the ones considered most hazardous) and the only Decade Volcano in the U.S. other than Mauna Loa in Hawaii. It’s the tallest peak in the Cascade Range, which is why it’s so visible from the Seattle area. When it’s really clear out, it can even be seen from parts of Oregon and British Columbia. The mountain looks a bit different in Seattle than it does in Tacoma. In Tacoma, you can see more of the crater. In Seattle, the top of the mountain is more rounded, but you can also catch sight of one of the smaller peaks on the side of the mountain. Mt. Rainier is the source of all kinds of rivers that flow through Seattle, Tacoma, and other cities in the area. These include the Puyallup River, which flows into the Puget Sound in Tacoma’s Commencement Bay.